In continuation with the Emmy's For Outlander campaign, I just have to post this cool interview Sam had with Gold Derby. This is a very interesting interview with tons of insight about the scenes at Wentworth and Outlander in general. Kristin Dos Santos had an early morning chat with Sam about Emmy Talk and his performance in Outlander. You can read the whole article HERE. I will post just a bit of the interview! Twice the goodies in one post!! Kristin: I was directed to [Outlander book series author] Diana Gabaldon’s Facebook page, and there are a lot of real victim reactions there that are touching, and they are overwhelmingly positive. You were able to show not just the physical ramifications but psychological ramifications and did things in a way that people did not find gratuitous. What does that mean to you? Sam: I have been contacted by people who have been in similar situations or in some sort of crisis. And I believe as well, it’s not just about the act that Black performs on Jamie. It’s about breaking him down and not just physically. Jamie can handle anything, but it’s the mental stuff that forces Jamie into some really dark places. And also seeing Jamie recover from that and deal with this traumatic situation is powerful. And it’s very individual. People in that situation deal with it in different ways, and have their own way of dealing with it. And it’s nice that we don’t shy away from it. That we don’t turn the camera away from it. That we see the aftermath of something like that . And it continues on into season two a little bit. Kristin:The word “Emmy” keeps being thrown out there. Even before the final two episodes and then particularly with the final two. Did you have any hopes or expectations when you signed up for this series that this show, and your performance, would be taken seriously as award-worthy? And how does it feel to know that not just the fans, but the media as well are saying, this is an Emmy worthy performance? Sam: It’s kind of a shock. You don’t think about that at all when you’re filming it obviously, and you’re just trying to do the best work you can. And I think if we are being talked about in any sort of capacity, it’s just because everyone is working their butts off on the show, and everyone’s doing a really good job. And if people want to reward it, then that’s even better, but I guess the best part of it is the reaction from the fans, and the people watching it, that’s the real payoff. If there is anything else beyond it, then that’s just a bonus. I am an avid book reader and when I am not writing for these2 two (now three) blogs that is what I am doing. I love Game of Thrones, Supernatural,Big Bang Theory, Criminal Minds, Blue Bloods, Outlander, Once Upon A Time, The Walking Dead, Fear The Walking Dead and many other shows. I am also a major hockey fan, especially my Detroit Red Wings! I also enjoy classic books and legal thrillers. 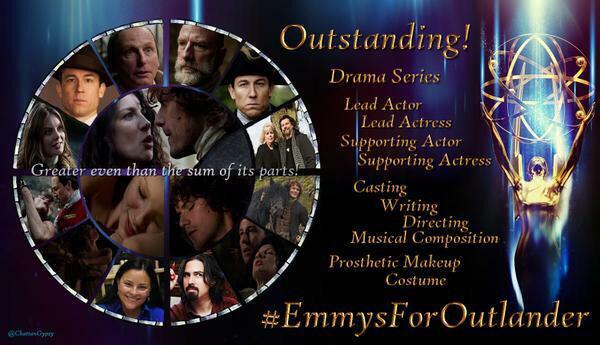 This entry was posted in Outlander and tagged Authors, BlackJack Randall, Catriona Balfe, Claire Beauchamp Randall Fraser, Diana Gabaldon, E Online, Emmy Campaign, Emmy Talk, gold Derby, Graham McTavish, Jamie Fraser, Kristin Dos Santos, Outlander, Ron D. Moore, Sam Heughan, Sony, Starz. Bookmark the permalink.